Eat Clean for 3 days! Each year, I do this after Spring Break! It's great to remind us about portions, eating clean, and getting back to food is fuel, not comfort. In 2015, I lost 9 pounds (2015 video diary), while losing 7 pounds in 2016 and 7-1/2 pounds in 2017 (2017 video diary). The inches lost were amazing too. Jeans fit better again. I reset myself from my Spring Break Splurge. This is great after a holiday, vacation, or anytime you want. You can order it monthly, quarterly, or annually, like me. Maybe you feasted like a king or queen over the weekend, and want to get back on track. Perhaps you simply just want to lose that last bit of annoying pudge. Maybe you used to eat healthy but little by little you fell off the wagon and now are ready to climb back on. It’s also possible you’ve never had a healthy diet but you’re finally ready to start. Sometimes you want to quickly drop a few pounds for an upcoming social event. Or perhaps you’re kick-starting a new workout program and want to shift into high gear right away. Or maybe, just maybe, you’re ready for a few days of clean eating just because it’s the right thing to do. Lose weight and kick-start healthier eating habits in just 3 days—while continuing to get your Daily Dose of Dense Nutrition® even after your Refresh is over—with the 3-Day Refresh and Shakeology Challenge Pack. This pack is designed to fast-track your weight loss by detoxifying and cleansing your system while helping you replace bad eating habits with good ones. In just 3 days you'll feel lighter and healthier, without starving. In 30 days, you'll feel like a whole new you. You can even start streaming thousands of dollars in proven Beachbody workouts, because your Challenge Pack includes 30 days of FREE access to Beachbody On Demand! If you choose not to take advantage of your FREE Trial Membership in the Team Beachbody Club, you may remove it from your Challenge Pack at checkout. This will not, however, change the price you pay today, and you will lose streaming access to thousands of dollars in workouts. You'll automatically receive a fresh supply of Shakeology every 30 days for only $129.95 per month, with an additional 10% discount if you are a Team Beachbody Club member (plus $2.00 s/h per unit) billed to the credit card you provide today. In addition, after your free 30 day Team Beachbody Club trial, you'll automatically continue your membership for only $2.99 per week, billed $38.87 quarterly in advance to the credit card you provide today. You may cancel either membership at any time by calling our Customer Service at 1(800) 470-7870. MAINTENANCE GUIDE – Bonus Gift! - This 44-page guide contains helpful info and tools to continue on the healthy eating track and maintain your results post-Refresh. Learn the principles of proper, clean nutrition and portion control while choosing a calorie target based on your personal needs. You’ll be able to select from a variety of delicious, nutritious food items, meal and snack ideas and indulgent Shakeology recipes. You’ll even learn to how to “dine out” the healthy way! 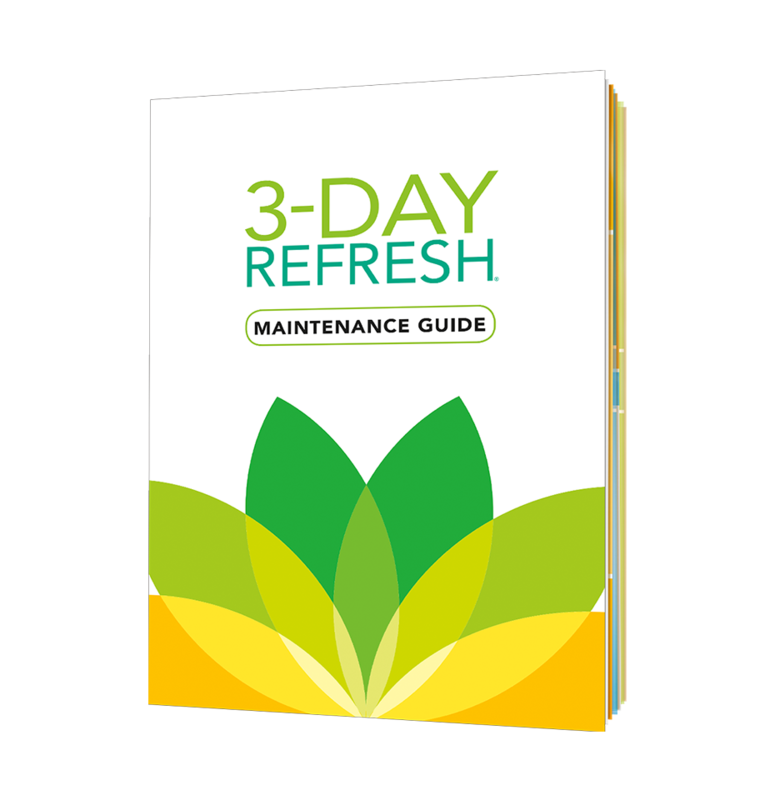 30-Day Money-Back Guarantee – We're so sure that you'll see the benefits of the 3-Day Refresh for weeks to come that we're backing the program with a 30-Day Money-Back Guarantee. Do the Refresh and if you're not still feeling lighter, leaner, and cleaner 30 days from now, return it for a full refund of the purchase price (less s&h). This 44-page guide contains helpful info and tools to continue on the healthy eating track and maintain your results post-Refresh. Learn the principles of proper, clean nutrition and portion control while choosing a calorie target based on your personal needs. You'll be able to select from a variety of delicious, nutritious food items, meal and snack ideas and indulgent Shakeology recipes. You’ll even learn to how to "dine out" the healthy way! Want an easier way to stick to your healthy new habits? Use your 3-Day Refresh Shaker Cup to stay on track—even on the go! It's the most effective way to maintain your energy and help you keep losing weight. This sturdy, 25-ounce shaker cup allows you to mix a serving of Vanilla Fresh or Shakeology® with water and ice in just a few shakes. It's also ideal for ensuring that you're drinking all the water you need throughout the day. Whether you're doing your Refresh at home or on the run, you'll want to keep this shaker cup nearby. Plus, it's designed to fit in most car cup holders. Get yours today!